It’s a Holly Jolly Holiday Trolley! Shopping local has never been easier this holiday season as shoppers can travel throughout Claremore on a free Holiday Trolley on Saturdays in December. Claremore’s Holiday Trolley was announced by West Bend Winterland as a way to encourage both shopping local and attending the activities at Winterland. The Trolley will leave from the grounds of the Claremore Expo Center and make continuous loops to several trolley stops, including Ne-Mar Shopping Center and two stops in downtown Claremore – one on Missouri and the other in the Claremore Daily Progress Parking Lot. All trolley stops will have signage to make it easier to spot for pick-ups and drop-offs. 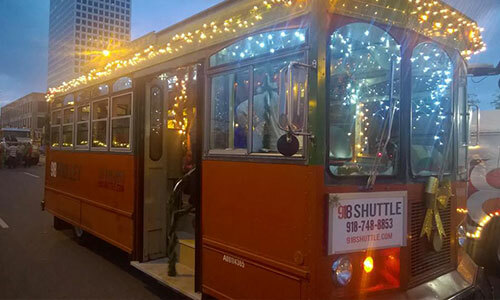 The Trolley will run from noon until 8 p.m. on Dec. 1, Dec. 8, Dec. 15 and Dec. 21. The complimentary service is made possible by West Bend Winterland, Claremore Main Street, the Claremore Chamber of Commerce and the Downtown Claremore Merchant Association. Many of the merchants in historic downtown will remain open until 7 p.m. or later, and folks can always grab a great meal or libations while they are out and about. “The merchants are excited to participate in West Bend Winterland and are glad to partner in the Holiday Trolley, which will provide shoppers a convenience we have not had in Claremore before,” said Sheila Giannelli, president of the Downtown Claremore Merchant Association. A full schedule of the Holiday Trolley and West Bend Winterland can be found online here or by calling 918-342-5357. A park and ride system is paramount for Claremore. Parking and backing out onto main street is a disaster wating to happen. Park and Ride will bring more people to downtown. Many people can not park and walk very far. It should be a regular part of the downtown experience.